Before you start designing a new block, you first need to set up the drawing board. The drawing board, no matter which type of block you are designing, is comprised of grid points—or snap points—that your drawing will “snap” to in order to create a workable block. Step 1: Set the grid to 24 x 24. Step 2: For more assistance, turn on the Graph Paper and set it to 4×4 (24 is divisible by 4). Step 3: Draw the block. Notice the segments snapping to the grid points that were set. Another useful method for determining the number of grid points is to put a grid point every quarter (¼) inch. If you draw a 4” x 4” block, use 16 and 16 (4 x 4 = 16) as your grid points. 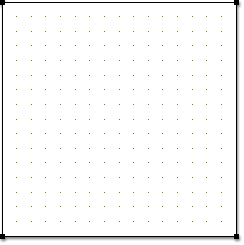 If your block size is 8” x 6”, then your grid points should be set to 32 and 24 (4 x 8 = 32 and 4 x 6 = 24). To set your grid points correctly, it’s helpful to visualize a grid of squares over the block you want to design. These divisions are helpful in setting up the grid points in EasyDraw™. 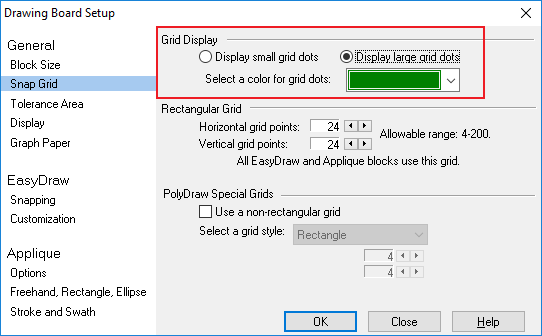 Try to find a block in the Block Library that is similar to the type of block you want to design and use it as a guideline for determining your grid setup. Study the block examples below. The red lines indicate the divisions of the block. Grid points can be set up in multiples of 3: 9×9, 12X12, 15×15, 18×18, 21×21, 24×24, etc. Grid points can be set up in multiples of 5: 10×10, 15×15, 20×20, 25×25, etc. Grid points can be set up in multiples of 7: 14×14, 21×21, 28×28, 35×35, etc. EQ8 has a default grid setup of 24×24. Since 24 is divisible by so many numbers, most of the blocks you will want to draw could use this setup. So, if you’re ever unsure of how to set your grid, start with 24×24.